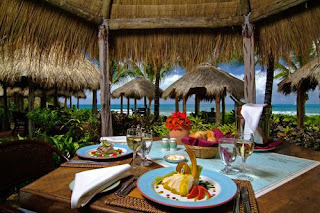 It is not always an easy task to choose great Caribbean resort for a honeymoon. This is because there are so many amazing romantic spots you can choose in the region. Some of the wonderful ideas will may have in mind for your honeymoon are spending it on a secluded Caibbean private island, relax in a world class all inclusive resorts, staying at a luxury beach hotel that give you access to some fun water sports activities and the beach, relaxing at a hotel in a stunning tropical atmosphere or choosing a hotel where you will find lots of entertainment. You will find resort in the region that specializes in these different types of romantic vacation. Let’s take a close look at some of the spots that can make your Caribbean honeymoon a reality. Our first stop will be in the Grenadines at the Palm Island Resort. You will get access to this resort through Canouan which is another Grenadines island located close by. However, you will have to use airports in St. Vincent, Barbados, St. Lucia, Grenada and Puerto Rico to get to Canouan. Palm Island is just a few minutes away by boat. This romantic Caribbean honeymoon spot is an excellent place for seclusion on a private island. You will have five beautiful beaches to explore and fun water sports activities. One of the things you will love about the island is the opportunities to roam and have fun between the palm tree and on the beach in a private island setting. This is also a Grenadines all inclusive resort as well. You will find some excellent villas suites at the location. There are also opportunities to play golf and tour the Tobago Cays Marine Park which is one of the top attractions in the Grenadines. In addition, this is the spot that will provide you with spectacular sunset dinners and some amazing services. This private Grenadines island is an excellent romantic vacation spot when you want a seclusion in a private Caribbean environment. The Buccament Bay Resort is an excellent all inclusive Caribbean spot for romantic vacation. It a place for beach cricket, soccer, tennis, kayaking, glass bottom boat tours, island hopping, dolphin and whale-watching, deep sea fishing, motor boat trips, snorkeling, and excursion to other scenic Grenadines Islands. 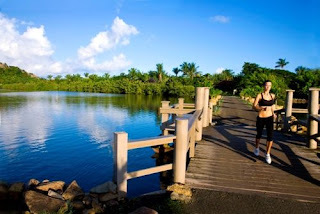 This Caibbean honeymoon vacation spot provide exciting activities at the resort. Excellent massages are also on offers with outdoor options you can choose. Whenever you are considering a brand of hotels that is top of the line, Sandals Caribbean Resorts always stand out. However, the Sandals Grande St. Lucian Spa is one of the all inclusive honeymoon resort that is excellent for young couples. St. Lucia is vacation spot that young couples will just enjoy overall, because of the amazing opportunities for hiking, exploring some world class attractions and enjoy fun activities at the resort. This resort is one of the most picturesque honeymoon spots in the Caribbean. The hotel blend in naturally with nature that you will really have a sense of what paradise in the earth made new will be like. You will find that you have stunning romantic views of nature that will really make you romantic honeymoon vacation memorable. There is no shortage of activities for fun at the resort as well. This is an excellent all inclusive Caribbean honeymoon resort to choose. The island of Antigua is another spot you will find excellent all inclusive resorts for Caribbean honeymoon. The Galley Bay resort is one of the finest you will find on the island. It is located in a brilliant lush tropical spot with amazing opportunities for romance and enjoy so fun water sport activities. Antigua is the country with a beach for every day for the year so you know you will be in for some fun on the beach. However, the resort is the place you will want to stay if you want to spend quality time getting to know each in a privacy. You will have the opportunity to go on romantic beach picnics, and have your massage done to perfection. This Antigua honeymoon resort will offer you a fabulous honeymoon that will ensure that all your romantic dreams in a Caribbean island become a reality. When is comes to quality honeymoon Caribbean island Jamaica needs no introduction. It is one of the spots in the region you will want to vacation. Couples Tower island is one of the oldest resorts in the Caribbean, so you know you are coming to a place that knows how to treat its guest. One of the amazing things you will love about this resort is it gives access to some of the top Jamaica romantic vacation activities and attractions. You will have easy access to the Dunn’s River Waterfalls which is one of the best in its kind in the world and an amazing romantic adventure attraction. Another attraction you will love in Ocho Rios is the Mystic Mountain Adventure Park which is just a place for fun and more fun. There will also be opportunities to go horseback riding on the beach which you will really enjoy. Although the resort has the distinction of being one of the oldest romantic Caribbean resort it has been recently refurbished so you will expect excellent facilities at the location as well. You will find other excellent resort all across the region for your romantic vacations. We have mentioned a few that will guarantee you a wonderful time in a tropical environment. Additionally, you will find the resorts are fantastic Caribbean honeymoon ideas that will make all your romantic aspiration a reality when you choose these locations. This Jamaica honeymoon resort is one of the best picturesque spots in the Caribbean. Situated on a peninsula surrounding by the calm Caribbean Sea waters the resort offer everything that is needed for romance. It is an excellent Jamaica honeymoon resort for relaxation in seclusion. The design of the location is everything to do with sophistication. There are excellent private plunging pool for couples who need to enjoy romance in seclusion. Snorkeling, windsufing and kayaking are some of the exciting water sports activities you can enjoy. You will also have access to some of the most challenging Caribbean golf courses from the location. This Jamaica honeymoon resort offer services such as romantic breakfast in bed, romantic massage, private beach dinners and fresh roses and fruits upon arrival of couples.